The son of a Caltharian merchant and an Avennorian trader-lass, Mens Lorson (1272-1295) lived an intense, yet only very short life. He is known mainly under his author's pseudonym "Monsonius" and is remembered for his romantic lyrics and his groundbreaking approach of writing semi-poetic novels by many a Santharian today, even centuries after his far too early death. Especially his re-discovery in the 16th century paved the way for a strong Manthrian tradition of the so-called "Monsonian poetry" which tries to follow the unique style of the works of this rather humble Marcoggian artist. Thus, without any doubt, Monsonius can be considered to be one of Santharia's greatest and most influential writers, who has remained unforgotten to this very day. Aside from his brilliant writings, his personal tragedies may have contributed to lending Monsonius an aura of immortality that only a handful of other writers share. Image description. 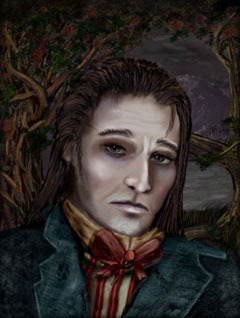 One of Manthria's moost famous sons, the poet Monsonius (Mesn Lorson). Picture by Bard Judith. Appearance. Though "portraits" of the Manthrian poets can be seen nowadays in many a publication or a museum in Marcogg, there unfortunately exist actually no confirmed drawings of the great writer. For one, Monsonius was a rather withdrawn person with only a few personal friends, so he was rarely seen in public. Rather, he was known to seek out a quiet place near a lively creek, where he could listen for hours. He shunned social events; some say one of the reasons was because of his sensivity about his slight hunchback, a deficiency he was born with. Fame came only after his death, despite his tragic liaision with the daughter of the Parthanul Count that brought him briefly into the public's eye, fame came only after his death. So while his works were valued by a handful of people of his literary circle, the sketches that were made of the person Mens Lorson existed mostly in written form. They would find their way into a proper biography not before half a dozen years after he had was interred next to his beloved Stela. He was then drawn based on such texts and the memory of those people who still had known Monsonius in person. His fellow writer Aimen Jolith, in his well-known "Memoirs of Time Past", probably provides the best insights on how Monsonius appeared to others when he writes in his memoirs: "I often wondered how that small, inconspicuous fellow that lived next to the bakery in the Northwall above the Mashdai came to that rich language. How he had learned that keen reasoning and how to dream at the same time, how he was capable of painting with words, yes, painting I'd call it - all those perceptive descriptions of people and landscapes that seem to descend on our world from somewhere else through the means of his quill. But yes, I wondered how that all happened, very much so, as he was so different to all the other writers I've known. After all I saw him buy the same kind of loibl every day at that bakery, never would he have dared to lay his hands on another kind, never would he have broken away from what he had been used to all his life. He must have appeared as a rather dull, even a gawky lad to everyone else on the street in the way he was scuffling home, his shirt's collar awry, his thoughts elsewhere. He would lean to the side a bit when walking, due to his deficiency from birth on, and I've heard the noblest ladies giggle when he was passing by. Though once they had had the honour of being introduced to Mens, their laughter would soon yield to wonder, as in his eyes was reflected the melancholy of his solitary life. He looked sad, yet mysterious, like a well whose depth you don't quite know unless you throw a stone into it. I recall that he was always frowning at the ladies of society when he first met them, and his out-of-place stern look made everyone feel as if staring into an abyss or at the open sky, wonderful or tragic, it was always hard to say. He had that mystery in his eyes, a sparkle that kept one guessing what lay behind that face. And then, when conversation was inevitable, he started opening up - and it usually caught everyone by surprise that he was actually a very entertaining and articulate fellow. I must admit I didn't know what to make of him, and eventually only got a glimpse of who Mens was in his writings, and most of this I only had the chance to see when he had already left this world." The most common sketches we have of Monsonius reflect this description perfectly, and it also might convey the character better than his actual appearance. Because as so often when a young person dies, an ideal image is kept in the hearts of those who survived the deceased - and soon an entire myth is born. Personality. From his early days of childhood Mens Lorson was destined to become lost in life. While he was born in Marcogg as a result of an affair of a visiting Caltharian merchant, he spent the first years of his life in Carmalad, following the wish of his reluctant father. But when his mother became sicker and sicker, Mens and his parents returned to Marcogg, only to bury her about a year later when Mens was nine cycles of age. In the following years his father was rarely present in Marcogg, leaving the education of his son in the hands of the best private teachers he could find while travelling the lands searching for business opportunites. Mens had difficulties in making friends - as soon as he had settled in Carmalad he found himself elsewhere, confronted with the loss of his mother and dire prospects without his father being around. More and more Mens slid into his own world, which mainly consisted of reading books from all parts of the world he could lay his hands on, and early on he tried to imitate these writers by constructing poems and writing imaginative tales. Often he would spend hours and hours on a simple paragraph, attempting to make the lines perfect, forgetting everything else around himself. Yet his loneliness and melancholy, the fact that he felt torn and lost in a world that wasn't made for him, always shone through in the pieces he wrote. His only hope for escape was doomed right from the start, when his muse, the beautiful Stela, succumbed to her long illness, which only made Monsonius even more reclusive. Interestingly, he rarely ever actually talked about himself in his diaries, though it was filled with observations on everything around him, with thoughts on it and how it could translate into his work. Monsonius also created texts of hope, of dreams and worlds that follow their own weird but strikingly beautiful kind of logic. All these works can stand entirely on their own and read very refreshing and uplifting. But on retrospection, once we take a closer look at the person of Mens Lorson, all his works somehow point back to his tragic existence, which followed a natural scheme he was convinced that he couldn't escape. "To suffer from fate means to simply experience accidental things that follow on purpose," Monsonius once remarked. "But it is preposterous to think that a mortal has any insight in said purpose, whereever it might have its source." And wait we do, hoping that the wind picks us up again. Indeed, quite a while the still, black abyss lurks far below us, yet we're rocking along as a God may will, away, away, above the eerie, august gorge. It's just a bold rumour that keeps us all afloat, yes, in awe - that there's something down there, and it's more than that claim, that it's just the leviathan's hideous claw. But the wind soon rises again once more, gives his marching orders, makes us free, and I grow and grow, and with me does the high awakening sea - whatever our paths cross, oh flee, just flee! The windy captain's minions we are then, his scepter being our guide, and while not prone to understand, we're dancing, splashing, roaring in our pride. Indeed that's mostly what there is to tell of our ocean's life, of our splashing, floating, raging, of continued strife. There we go, drifting, mumbling, rocking all along, constantly singing our never-ending monotonous song. And I feel happy on my way, as I'm not all on my own, happy we're together, together heading towards the unknown. Once the wind needs us again, we surely do oblige. With confidence I let him take me, give my fate all into his hands, as I trust him, even more than the Injèrá herself. Yes, he will once bring us to these distant lands, and we'll reach that place that destiny for us demanded. And I'll finally be there, stranded. -- Diaries of Monsonius, "The Years 1290-1992", page 54 f.
Biography. Unplanned Child (1272). Mens Lorson was born during the Age of Discovery, a tranquil, thriving time for the United Kingdom of Santharia. The wars of the south were long over, what had been destroyed was by now rebuilt, and trade between the tribes and races was better than ever. So it happened that a Caltharian merchant by the name of Thertin Lorson visited the Manthrian province, where he made the acquaintance of the daughter of an Avennorian business contact, Menja Skangarris. One thing led to another, and the merchant and Menja ended up in the same bed following a raucous festival in Ciosa. And as far as the merchant was concerned, this was all there was to it and should ever be. Yet a few months later he received a letter from Menja, who had found out about his address by going through her father's business contact list. Thus he learned that Menja was pregnant with his child and that the disgrace of a premarital child was too much to bear for her in face of her family that held high moral standards. So she left Ciosa once and for all, begging him to help her deal with the situation that concerned both of them. Reluctantly Thertin Lorson followed her wish and paid the rent for her hideout in Marcogg, and briefly stayed in the town as well in the last months of Manja's pregnangy. The child was named Mens (following his mother) and received the second name from his father. Mens was born with a slight hunchback, which was barely noticeable at first, but which would develop more prominently in his early teens. The Early Years in Carmalad (1273-1279). Only a few months after Mens' birth, his father decided to bring him back to his own homeland, to the Caltharian port town of Carmalad. While this seemed to solve all problems at first, Mens' mother soon became ill after the arrival with a condition that the healers couldn't put into a drawer. Some say the she couldn't get used to the Northern port town air of Carmalad and its strong breezes, others say that leaving her family forever deeply gnawed at her and that it was only a matter of time until she succumbed to her feelings of guilt. The illness of Mens's mother became more and more troubling and his father lost many business opportunities due to that as he made many sacrifices in order to tend to her personally. Both their lives were about to be destroyed. In all that Mens himself spent little time with his parents, instead his father invested in nannies and teachers that should raise him while his mother was incapable of doing so. But hope that her life could still be saved dwindled as the months passed. The Return to Marcogg (1280). When Mens was eight cycles of age, his father finally gave in and the family moved back to Marcogg, in the hopes that the condition of Mens' mother would improve. The family even settled in the very same house where Menja had given birth to her son, a small cottage in the Northwall District above the Mashdai River. It is obvious that Thertin tried his best, confident that the memories of her son's birth would help his wife recover. But it was already too late. Death of Mens' Mother Menja (1281). When Mens' mother died as a result of her illness where nobody could fathom what caused it and how to counter it, her only son was nine years of age. The tragedy hit the family hard, as the only center of attention for many years was now gone, and while Thertin still had money left, he needed to pick up where he had left and put all his energy into re-establishing business contacts and earning money. Mens still needed education and therefore was left back home most of the time while his father travelled around Manthria. He was taken care of once again by private teachers, destined to follow in the footsteps of his father as a merchant as well. Yet, soon it became clear that he was better with dealing with words than juggling numbers. First Work, first Encounter (1288). Aged sixteen, it became apparent that Mens was highly talented in various fields, which resulted eventually in a position helping out with bookkeeping for Count Jorscogg, Lord over one of Manthria's coastal fiefs, Parthanul. Jorscogg had an office in Marcogg to handle administrative procedures and was happy to welcome the young and promising Mens. Soon it turned out that Mens also felt strangely attracted to the third and last daughter of the Count, Stela, who apparently was strikingly beautiful, yet suffered under a supposedly uncurable mental disease that caused a persisting depression. She usually avoided company and rarely talked, and like Mens she had lost her mother early on in life. Due to these symptoms she was constantly under observation by local healers, who prescribed her long walks in the countryside. Mens, already back then a quiet, even reclusive person, however seemed to relish Stela's presence and she his, and they often walked together along the Northwall, over parts of Stormwarden Ridge, happy to be together, and interestingly - as observers tell us - often without speaking a single word for hours. The Count approved of his daughter's relationship with a commoner, knowing too well that there was little else he could do to make her happy. It was at that time when Mens started to write seriously, first by composing songs and poems about nature and beauty in general, which he'd recite to Stela. From that time also date his first diary notes. Mens considered her his inspiration, his muse, yet it seems that both were happy with these circumstances, and soon the first fruits of Mens' work would show. First Publication: "Man" (1289). By 1289 Mens had already produced dozens of poems, elegies, parables and fables, which brought him an invitation to a literary circle, that had gotten aware of his talents. As many believe, the invitation was probably suggested by Count Jorscogg himself. Reluctantly Mens agreed to share his works there, yet only appeared occasionally to discussions. Nevertheless, he received offers to publish his works - and as he always was in need of money, he gladly accepted. For some reason he decided not to use his birth name when he published his works and instead went for "Monsonius", a tradition that would become very popular much later in the 16th century among his followers, the so-called "Monsonians". The first novel Monsonius finished was titled "Man" and deals with a man, or more precisely a human, who is convicted for a crime that is never specified in the entire novel, nor whether he is actually guilty or not. Written from an entirely subjective point of view, the protagonist expects execution, yet is spared from it and put into a dungeon, where he eventually is forgotten. Whether, and if so when, he dies in that dungeon only the reader can decide, as storytelling shifts from actual happenings to memories to dreams and back again. Monsonius already weaves many lyrical passages into the novel, and at times it seems that everything dissolves in an otherwordly dream, which by many is interpreted as a reference to Avá's eternal Dream. The title itself also hints at the fact that the story is a parable on the human condition that is trapped in a prison of restraints where there is no escape, and that there are other truths out there that transcend it. While not fully understood and appreciated upon its publishing, the book made Mens a respected person among other writers and he earned enough money to be able to persue a career as a writer. Fate strikes again - the Disappearance of Thertin Lorson (1291). In early 1290 Mens saw his father for the last time. It is no secret that Thertin had turned to drinking after the death of his wife and that business wasn't taking the direction he had planned, but somehow he had always struggled through it. In spring 1290 however he suddenly disappeared, for reasons unknown. He was meant to go on a business trip, yet he never arrived on his destination and a body was never found. Mens was now left all alone, yet now with 19 cycles of age he was already a man by himself and earned money through bookkeeping and writing. His only consistent relationship was with Stela Jorscogg, other than that he became even further withdrawn, dedicating most of his time to writing. He had several narrations, many poems and even two stage plays published that year. "The First Battle" (1293). More and more Monsonius became an established writer with every piece he published. After two more volumes of poetry he finished the monumental 700-page long novel titled "The First Battle", dealing with people who are supposed to defend a besieged city from an impending onslaught. The book describes only the preparations for the inevitable fight, the considerations, the various beliefs, the fears and the tragedies within the people of the town before the assault actually happens. The book ends at the moment the battle begins. Many scholars consider the "Battle" Monsonius's masterpiece, as it reflects on many different perspectives of a situation, presented in a gripping, suspenseful way, where everyone has to decide upon his or her ultimate priorities in the face of death. Destiny seems to move the pieces on the board in a way that there is no escape on from decision-making for anyone - and there are some suprises in store. The Death of Stela Jorscogg (1294). On a bright summerday morning in 1294 Monsonius lost his last anchor in life. The beautiful Stela, his friend and muse, died peacefully in her sleep while resting in the garden. Shaken by the course of events that seemed to eliminate all hopes and prospects he ever might have had, Monsonius needed weeks to write another line. Eventually he sat down to get the famous poem "A Bright Summerday" committed to paper, a document about the transitoriness of life and a touching remembrance to his beloved muse. Again and again the day of Stela's death haunted Monsonius, and he wrote a multitude of poems on the subject from various angles, which later came to be known as the "Summerday Cycle". Each of these pieces displays extraordinary mastery of his craft. The Death of Monsonius (1295). Beginning with "A Bright Summerday", Monsonius didn't seem to drop his quill for several months. He wrote dozens of fantastic tales in his semi-poetic style at that time, aside from long elegies and extensive diaries. He finally began a major, yet untitled work that should deal with the "breath of the world" as he put it at some point in a side note of his diary. Alas, many of the things he started and was working on, remained unfinished. One summerday in late Sleeping Dreameress 1295 Mens Lorsen was found at the Stormwarden Ridge, a place where he and Stela had often enjoyed the beautiful view, looking at the Mithral Mountains, the Canyons of Ar'Zunith, and far in the distance, Keep Mistrash. There he lay at the bottom of the gorge, his neck broken. He was carried home for final prayers on his deathbed by his writing colleagues who had found him, guessing that he had been visiting Stela's grave on the foot of the mountain. Thus the third and last member of the Lorson family had died within just a few years, but one cannot say that this unfortunate family did not leave its traces in Santharia's history. With Monsonius died one of the kingdom's greatest poets, forever to be remembered. Importance. The unplanned child Mens Lorson, better known as "Monsonius" to most of the world, became one of Santharia's greatest literary treasures. Although during his lifetime Monsonius did not receive the appropriate response from the readers which would have been justified due to the quality of his writings, he never ceased to continue in his lyrical efforts in order to describe the world he was part of and to transcend it in any way he possibly could. Only years after his death he received first substantial recognition, and it was not before the 16th century of the Santharian Calendar that Monsonius was re-discovered by Santhalian scholars. Thereafter, his works have remained unforgotten. A literary movement following Monsonius' footsteps arose in said century in the Manthrian province, consisting of independent writers that produced various works in the tradition of their Avennorian idol. It was spearheaded by the Ciosan poet and sailor Chyrán, who was often referred to as the new Monsonius. In 1558 he became famous overnight with a typical poetical novel written in Monsonian style, which he left without title. This work, by many known in the meantime as "The Ring" is an extraordinary cyclic story, that slows down and speeds up in what critics described as a "dance between prose and lyrics, between fantasy and reality", even more daring, more engaging than Monsonius himself ever managed to accomplish in his texts. The book is written from a subjective point of view where the protagonist returns from a long voyage on the sea and discovers himself already sitting in his house upon arriving home. He observes himself working on a novel describing a man returning home from a long voyage on the sea. As the protagonist looks over the writer's shoulder he seems to read about himself and his return home, but still things change miraculously chapter by chapter when the character in the book discovers another alter ego and so on. This leads the reader more and more into a world where nothing is what it seems and at the same time the reader gets overwhelmed with fascination by the strong poetry found in the text. People old and young of very different education levels seem to enjoy Chyrán's poetic novel. Even sailors take it with them on long trips, reading it again and again, constantly discovering new sides in the text, and being lulled into sleep by the rhythm of the lyrics found in the book, reminiscent of the breath of the sea while conveying an aura of peace and tranquility. Undeniably "The Ring" is a stylistic masterpiece, where the author has studied the works of Monsonius rather well, and if one looks closer at the text one may also discover that there are many references to a certain poet from Marcogg in it that are not apparent at first glance. Actually, after several scholars have studied the text meticulously, it seems to be common belief that the protagonist of "The Ring" is no other than Monsonius himself. There's no greater honour a Santharian poet can receive than to be worked into a masterpiece of another poet, and the fact that dozens of scholars were needed to decipher the text in order to notice his presence which is right before one's eyes clearly adds to that. Today Monsonius's work is essential for a multitude of people - for lovers, who cannot get enough of his "Summerday Cyle"; for those who have to face their foes, be it as internal struggles or against actual enemies in a war, "The First Battle" is literature one shouldn't miss; also Monsonius's fables give advice or pose necessary questions everybody should deal with - and finally for people to bridge the differences between the races there's always the monumental work of Monsonius he simply titled "Man". It is hard to find a person who should not be recommended to read the poet's works, as in his texts so much is reflected "that it is frightening to see how he lived a full life-time and more in his mere 23 years" as a recent critic put it. And to those that seek the author himself in all those fabulous texts, his diaries included, and find little of him, should be recited the enigmatic words of the likewise immortal Chyrán: "Don't look for Mens in his works. But there's surely someone to be discovered in there when you read his texts. At least he has already found you. Maybe you'll find someone too." 13th Rising Sun 1669 a.S.